Published on March 3, 2009	in Crafty, Knitting and Spinning. 1 Comment Tags: Knitting, Spinning, stitches west. I did my (small) part to stimulate the economy this weekend through a bit of shopping during the Stitches West 2009 conference. I had a great time this year-enjoying some time with friends and not getting too over-stimulated. Want to see what I got? 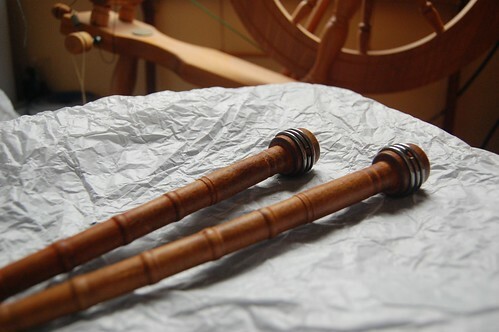 First, at the top is my new spindle. Made by Greensleeves Spindles from bloodwood in the style “Vixen” weighing in at 0.6oz. 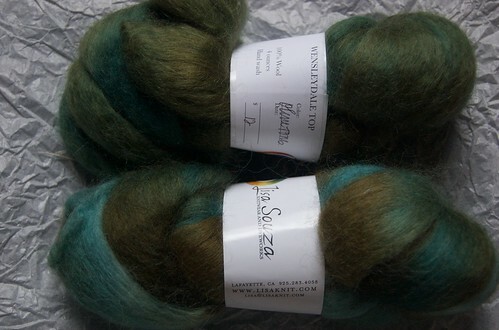 Wensleydale top in olive tones (8oz total) from Lisa Souza. 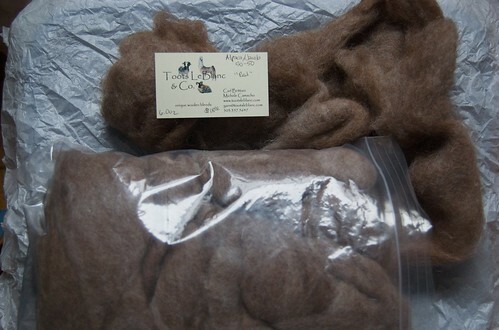 Alpaca/Jacob blend in Red (6oz) from Toots LeBlanc. A bit of Brenna! 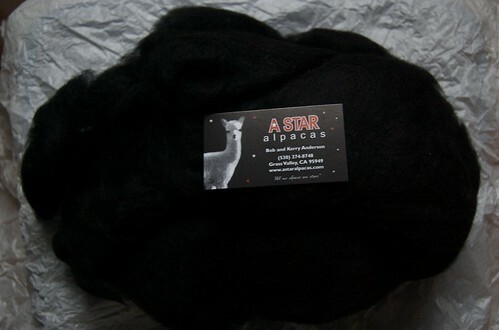 Prepared alpaca fleece (from Breanna) in jet black (3.8oz) from A star Alpacas. 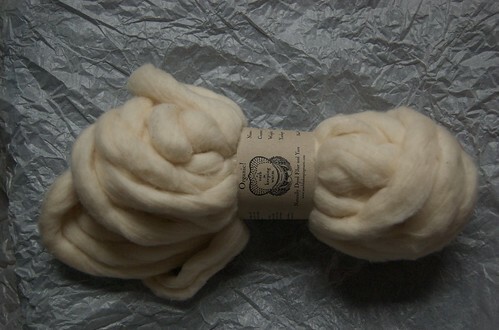 Undyed cotton (2oz) from A Verb for Keeping Warm. 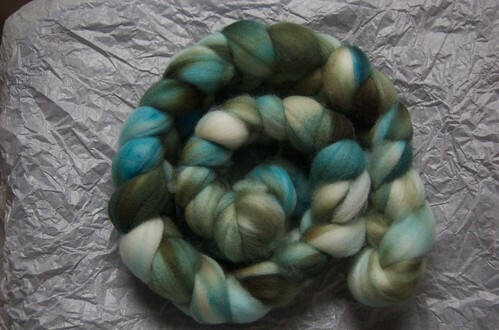 I’m excited to give spinning cotton a try and I know I can always get more from Kristine’s shop (brick and mortar!) when I get the hang of it. 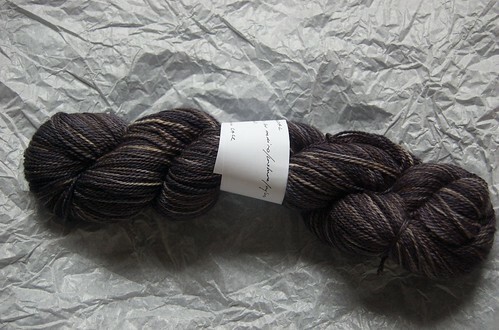 and one skein of “siren two lace” in charcoal. I was also really excited to pick up some textile bobbins from Krista’s booth. 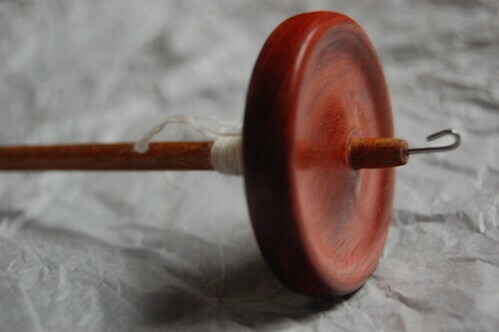 I missed out on the bobbins at Color last October so I was happy to snag a few this time around. It would, perhaps, have been a little easier to show all of these purchases in a single photo. Unfortunately natural light bright enough for photos lights up barely a few square feet of my apartment during weather like this (read: gray and rainy). I’ve currently got some kind of illness to go along with the gloomy weather. It is always a bit disappointing being sick. I feel bad staying home (and not getting work done) but I can’t really do anything fun at home either. My brain is a bit shot and my head and neck are very achy. Lets just hope I wake up tomorrow fresh as a daisy and let the week go on. In any case, Stitches was fun and made me excited to make things, just as soon as I recuperate enough to think about it. Oh, if only people reading this could TOUCH the wonderful softness that is Brenna. So lovely!